Start reading WARATAH on your Kindle in under a minute. An enthralling tale of motherhood, war, betrayal, and love. Sam Cawthorn International Best Selling author and CEO/Founder of Speakers Institute. The Waratah, is an exceptional piece of writing. Ha-Le's words take the reader on an extraordinary tale of personal tragedy, heartbreak and perseverance. The Waratah is an incredible read oozing with openness and vulnerability. It's pages are filled with adventure, curiosity, and strong links to Vietnamese culture. It's a fantastic read! Kirsty Salisbury Speaker - Podcaster - Coach & Author - Auckland- New Zealand. A Poignant and Powerful Tale of Love, Pain, and Growth. Ha-Le's story is incredibly moving and powerful. The story weaves the past and present together so beautifully. I admired Ha-Le's courage to share her life struggles and the many obstacles she overcame in her life. Her love of life is undeniably contagious. Captivating. A story of adversity told with wisdom and humility. I found I couldn't put it down- there were so many inspiring moments! Amazing life journey with full of courage and inspiration! Author, Early Childhood Educator, Assessor &Trainer, Parenting and Life Coach, Speaker, Facilitator, Energy Medicine Healer. Ha-Le is a survivor of a dysfunctional family, child abuse, the Vietnam War, a boat people and a refugee in Australia. She is a three times survival with three different cancers. Ha-Le also taught herself English and obtained Bachelor of Teaching, Diploma in Child Studies, Positive Psychology, Diploma in NLP and Hypnosis and has a host of other qualifications in her toolkit. Ha-Le was a founder, former director and Authorised Supervisor of Birrong Preschool in Sydney. She was very successful in her educational business, and she taught and cared for the young children with her great passion. 5.0 out of 5 starsStrength through vulnerability. The reader is safely by Ha-Le Thai side right through this fast paced memoir. Ha-Le’s sharp insights on humankind’s vulnerabilities and sources of strength are felt together as significant and unforeseen circumstances present, but they do not wash us off course, they deepen, the circumstances are just that, Ha-Le teaches us the deeper transformative world of education, formal or informal, mentors or self reflection, keep it close, always inform oneself. A deep pleasure to read. This memoir expresses the true meaning of resilience. HaLe Thai tells her story openly, vulnerably and with humility. It encourages focusing on positives during times of adversity, and to always hold hope for the future. 5.0 out of 5 starsStrong,courageous and inspiring. I was unable to put this book down. From the first page to the very end I was captivated by Ha-Le’s story. What an incredibly strong and courageous woman. Ha-Le is so inspiring. A wonderful read. I highly recommend. 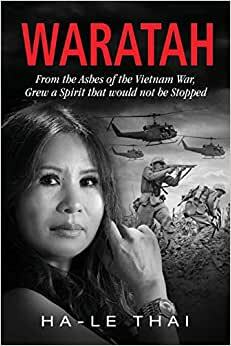 A well-written memoir that provides powerful insight into the life of Ha Le as she escapes Vietnam, relocates to Australia and comes to terms with her past. Haunted by the traditions of Vietnam and the decisions her daughter makes, Ha Le faces many difficult life situations that challenge her faith and love. An emotional memoir that allows the reader to connect with the trials that Ha Le suffers involving two different cultures, expectations and finally overcoming her past to rise above and discover her true self. From childhood to adult, her haunting past clearly affects her daily life until she is faced with losing her daughter, and her life to lymphoma. In a masterfully written memoir, Ha Le describes her childhood vividly laying the groundwork for a clearer understanding of her fears and struggles. This memoir shows the strength and resilience of one woman with incredible insight into the devastating effects of one of the most controversial wars. A must read! This memoir captures the true strength and resilience of the human heart. It's told between a past and present timeframe, contrasting modern life in Australia with the author's childhood and adolescence in Vietnam. Her insights into both cultures are fascinating, and she shares the hardship of her own growth and love of her family with honesty and vulnerability.